Can you never really enjoy using your deck unless you choose not to look at it? There are splinters and cracks you don’t quite know what do about. And it looks like it needs to be stained but you don’t want to spend that kind of money too often. Well, the deck industry has actually been working quite hard to meet the needs of deck-owners like you, even though they haven’t done a particularly good job telling you about it. They realize most people don’t really enjoy spending the time and money to stain their deck, and are willing to trade-off maintaining its natural appearance for the opportunity to stain it less frequently. Below you’ll find our “6 Degrees of Restoration” if you are seeking to stain your deck less often! 1. Transparent Stain: Highlights the wood’s natural appearance, but provides the least protection. You may have to stain every single year to protect the deck from weather. 2. Semi-Transparent Stain: Contains some pigment and more protection. So, prepare to stain every other year. 3. Solid Color Deck Stain: Now we’re getting more serious about protection, and less serious about highlighting the wood. Ought to last 4-5 years before you need to stain again. 4. 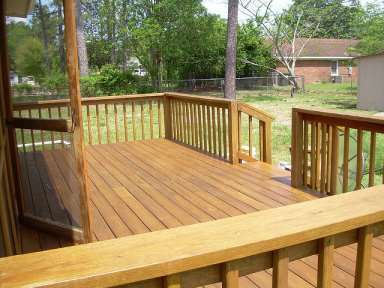 Deck Paint: So, let’s forget about the wood’s natural appearance and concentrate more on overall color and protection. Maybe we’re up to every 5-6 years now. 5. Deck Restorer: Oh, there’s wood under there? Now we’re talking about layering a new thin surface over the deck boards, perhaps even filling in all the cracks and masking the wood’s overall texture. Some manufacturers claim this product will last for 12 years. 6. Composite Decking: If you like the look of wood but don’t care whether or not it’s real, NEVER want to stain your deck again, and your financial situation is comfortable, this is the right solution for you. Replace your wood boards with these. Call us and we’ll show you samples. If you want to stain less and enjoy your deck more, give us a call and we’ll figure out the right solution for you. Most homeowners have an uneasy relationship with their decks. While they might have a beautiful home, they sometimes wonder why their deck has to look like something Huck Finn hitched to it after floating down the Mississippi River.They may never be at peace that it is completely right – maybe some of the boards have rotted, the top rails are dried-out and cracked, and that wobbly stair rail – is someone going to get hurt by that someday? And then there’s the guilt. If only they stained it its first year…or every five years…or ever at all. Well, I have good news — you don’t have to love-hate your deck. You can just love it. But, it helps to make sure you’ve got the right one, or convert it to the right one when major repairs are in order. Here’s how to think about decks so you can stop thinking about, and start enjoying, yours.